Pregnancy is a hypercoagulable state associated with an increased risk of venous thromboembolic disease (VTE). We retrospectively studied 38 Caucasian pregnant women with thrombophilia risk and compared their obstetric outcomes with a matched cohort without known thrombophilia risk during the period between January 2007 and December 2010. There were (2) cases with factor V Leiden, (6) prothrombin gene mutation, (1) antithrombin III deficiency, (2) protein C deficiency, (3) protein S deficiency, (10) MTHFR mutation, (7) anti-cardiolipin antibodies, and (1) lupus anticoagulant. Patients without thrombophilia who presented with recurrent unprovoked VTE were considered as high risk (6 cases). Most patients received anticoagulation (34/38) with aspirin only (6), enoxaparin (27), and warfarin (1). 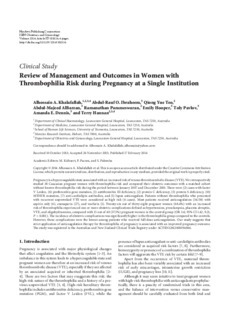 Twenty-six out of thirty-eight pregnant women (68.4%) with an increased risk of thrombophilia experienced one or more obstetric complications defined as hypertension, preeclampsia, placenta abruptio, VTE, and oligohydramnios, compared with 15 out of 40 (37.5%) pregnant women in the control group (OR 3.6; 95% CI 1.42, 9.21, P < 0.001). The incidence of obstetric complications was significantly higher in the thrombophilia group compared to the controls. However, these complications were the lowest among patients who received full-dose anticoagulation. Our study suggests that strict application of anticoagulation therapy for thrombophilia of pregnancy is associated with an improved pregnancy outcome.